Akkadian is the designation for a group of closely related East Semitic dialects current in Mesopotamia from the early third millennium until the Christian era. Closely connected to it is Eblaite, the language found at Tell Maradikh (ancient Ebla) in northern Syria. Old Assyrian is mainly known from letters and economic documents excavated in eastern Anatolia, chiefly in the lower city at Kultepe (ancient Kaniš) where an Assyrian mercantile colony (kārum) was located at the beginning of the second millennium. The corpus includes a small number of royal inscriptions and about a dozen literary texts, including some incantations; a few of the texts originated in *Assur and other north Mesopotamian sites, such as Nuzi. The best known Middle Assyrian document is the so-called "Middle Assyrian laws" from Assur, dating from the middle and second half of the second millennium B.C.E. Economic and legal documents and letters are also attested. Neo-Assyrian texts consist for the most part of letters and economic documents with a few literary texts. Documents written in this dialect come to an abrupt end with the destruction of Nineveh and other cities in 612 B.C.E. and the complete collapse of the Assyrian Empire shortly thereafter. It should be noted that the Neo-Assyrian royal inscriptions are written in Standard Babylonian, as are the inscriptions of the dynasties ruling southern Babylonia in the first millennium B.C.E. The relative absence of legal material from the private sector seems to be due to an increasing use of Aramaic. Old Babylonian is richly documented in large numbers of letters, economic records, state and legal documents, including the Code of Hammurapi, royal inscriptions, and a sizable corpus of literary texts consisting of hymns and various types of lyric and epic poetry. Several dialects, some showing substrate influence, can be discerned: a southern and northern dialect in Babylonia, a northeast dialect centered in the *Diyalah region, and provincial dialects such as those from Susa and *Mari . Literary texts are generally written in a poetic register (formally called "dialect") which exhibits archaic forms and syntax. This poetic dialect, the so-called "hymnicepic dialect," could be either a survival of an earlier stage of the language or an older dialect with close affinities to Old Akkadian in a restricted stereotyped use. Post-Old Babylonian Akkadian literature from all centers is usually written in a linguistic register which is an artificial literary offshoot of Old Babylonian, and is influenced by archaic forms current in the older poetic dialect, called Standard Babylonian. Standard Babylonian was cultivated by the scribes for literary purposes from the middle of the second millennium and through the first millennium B.C.E. until Akkadian ceased to be used. Standard Babylonian suppressed literary creativity in local dialects, e.g., Assyrian, but it tends to show a strong influence of the locally spoken tongue. Middle Babylonian is attested in letters, economic and official documents, and a few literary documents. While the size of the corpus of Middle Babylonian texts found in Mesopotamia proper is moderate, geographically this dialect (and variations of it) is the most widely spread and was used all over western Asia during the second millennium B.C.E. The Akkadian material from the archives of Bogazköy and Ras Shamra ( *Ugarit ) are written in local forms of Middle Babylonian, as are the letters of El *Amarna found in Egypt, which, however, originated in Anatolia, Syria, Palestine, and Mesopotamia. The wide diffusion of Akkadian during the period was due to its use as a diplomatic language. Neo-Babylonian is likewise represented mainly by a large corpus of non-literary sources, especially letters and economic documents. The use of the last surviving "living" dialect, Late Babylonian, petered out completely during the Seleucid period. Standard Babylonian continued to be in use in the temple scriptoria, in the transmission of canonical compositions, and in the compilation of astronomical texts which are the last remnant of the Mesopotamian tradition. The latest datable text so far recognized is an astronomical almanac written in 385 Seleucid era (74/75 C.E.). Akkadian is written with signs which apparently were originally devised for Sumerian. The application of the Sumerian system to Akkadian resulted in a mixed method of writing: on the one hand with logograms and, on the other, with syllables of the type vC, Cv, or CvC (C = consonant; v = vowel). The phonemic system and structure of Sumerian is radically different from that of Akkadian and the writing system consequently presented inadequacies which were only partially overcome during the long history of writing Akkadian. A phonological interpretation is likewise hindered due to a tendency toward historic writing. The vocalic phonemes represented are the long and short a, i, u, e. E does not seem to be original but is derived from a or i; e.g., ilqaʾ > ilqe ("he took"), while i tends to become e, especially in Assyrian, and the etymologically long ī became ē already in Old Babylonian times. Rare mixed writings, e.g., ma-ru-iṣ (Old Babylonian; "is sick"), have been used in attempts to demonstrate other vowel qualities, in this case the u-i sequence being taken as representing u̵. Greek transcriptions from the Seleucid period which reflect the pronunciation of Late Babylonian represent u by o, e.g., οζον = uzun ("ear of"), and u by ω, e.g., νωρ = nūr ("light of "). Diphthongs are monophthongized, e.g., ‡ayn- > īn- ("eye"), ‡mawt- > mūt ("death"). (The double dagger, ‡, indicates the reconstructed form.) Pseudo-diphthongs, such as Old Babylonian nawrum ("bright"), probably represent nawirum. A basic characteristic of the Assyrian dialects is the vowel harmony operative with short unaccented a in an open syllable which assimilates progressively, e.g., awutum (nominative singular), awitim (genitive singular), awatam (accusative singular; "word"); in Babylonian: awatum, awatim, awatam. Vowel length is phonemic, e.g., šarratum ("queen"), šarrātum ("queens"). The considerable reduction in consonants characteristic of Akkadian (and of later forms of other Semitic languages, such as Hebrew and Aramaic), as compared to the theoretically reconstructed consonant phonemes of Proto-Semitic, or those of other Semitic languages such as Ugaritic or Arabic, is already evident in Old Akkadian. By the time of the earliest written Akkadian, the dentals ḏ, t̞ and d̞ had shifted to z, ṣ, and ṣ respectively, while ṯ was on its way to š̱ but in Old Akkadian is distinguished graphically from etymological š and ś. Of the various phonological changes affecting consonants as a result of environmental conditioning two should be mentioned. In the nominal patterns mapras and mupras (except in certain nominal forms, e.g., the participle of the verb of the derived themes; see below) of roots containing a labial phoneme, m dissimilates to n (Barth's Law), e.g., ‡markabtum > narkabtum ("chariot"). Likewise, in any given root one of two emphatics dissimilate, viz, ṣ > s (very rare), q > k, ṭ > t – in this order of stability (Geers' Law), e.g., ‡ṣabātuṃ >ṣabātuṃ ("to seize"), ‡qaṣābu > kaṣābu ("to cut away"). Initial w disappeared already in Old Babylonian, e.g., warḫu (Old Babylonian), arḫu (post-Old Babylonian; "month"). In Assyrian, wa- > (wu >) u, e.g., warḫum > urḫum. Babylonian intervocalic -w- > -m-, e.g., awīlum > amīlum ("man"). In Assyrian, wa- > wu > u, e.g., warhum > urhum. Babylonian dēq ("is good"). On the other hand, intervocalic -m- in Late Babylonian > w or ʾ, e.g., Šamaš > ‡Š(a)w(a)š ("the sun god" (from Aramaic transcriptions); cf. CAYH for šamē ("of heaven") in Seleucid Greek transcriptions; cf. Hebrew סיון(< Simānu). Survival of the y is limited. Nouns and adjectives show structural patterning as in other Semitic languages, e.g., parrāsum as an "occupational" pattern, e.g., dayyānum ("judge") or qarrādum ("warrior"); and maprasum indicating instrument or place, e.g., maškanum ("depot"; cf. Barth's Law above). Formally, there are two genders, masculine (zero marker) and feminine (at marker). There are three numbers: singular, plural, and dual. 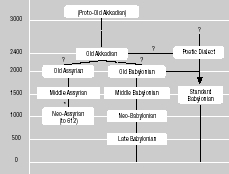 Mimation in the singular of both genders and in the plural feminine, and nunation in the dual are regular until the end of the Old Babylonian and Old Assyrian periods. The singular is triptotically declined forming a nominative, accusative, and genitive in the earlier periods, yielding later to a binary opposition of nominative/accusative and genitive. The plural and dual are diptotic. Traces of a productive dual, nominal, and verbal, are evident in Old Akkadian but by post-Old Akkadian times it has become virtually vestigial, surviving mostly in set words and phrases. The vocative is expressed by a stressed form with zero ending in the singular, e.g., eṭel (< ‡eṭel, "O, youth"), kalab (< ‡kalb, "O, dog"). Plural vocatives seem to coincide with the nominative forms. The morphology of the adjective differs from that of the noun uniquely in that the masculine plural exhibits the morphemes -ūtu(m) for the nominative and -ūti(m) for the oblique cases, e.g., šarrū rabūtum ("the great kings"). The construct case of the noun is a short form with the case markers removed or reduced, e.g., bēl bītim ("the householder"), ilšu ("his god"), mārat awīlim ("man's daughter"), ilū mātim ("the gods of the land"). The noun or adjective, used as a predicate, can be declined with the bound suffix personal forms, those of the first and second person showing affinity to the personal pronouns, e.g., šarrāku ("I am king"), lū awīlāt ("be a man! "), while the third person shows gender and plural affixes only, e.g., libbašu ṭāb ("he is satisfied"), Ištarrigmam ṭābat ("Ištar, sweet of voice"). Feminine nouns are declined in the stative without the feminine marker, e.g., gašrāte malkāti (< malkatum) šumūki ṣirū ("You [Ištar] are powerful, you are a princess, your names are majestic"). Prepositions govern the genitive ease of nouns, e.g, alpam kīma alpim ("[he will replace] ox for ox"), and most prepositions can also function as conjunctions in which case the verb appears in the subjunctive, e.g., kīma ērubu ("when/as soon as he entered"). It should be noted that ina ("in"), ana ("to") and ištu ("from") suppleted the common Semitic prepositions b,(ʾ)l, and mn respectively at a preliterate stage of Akkadian. Common negations are lā and ul, e.g., lā iddinūšum ("they did not give him"), ul aššat ("she is not a wife"), lā kittum ("untruth"). Conjunctives are u, "and," "or," e.g., bēl šamē u erṣetim ("Lord of heaven and earth"), and the enclitic -ma used post-verbally as a sentence conjunctive, e.g., ul itārma… ul uššab ("he shall not return and take his seat [as judge]"). After nominal or pronominal forms, it forms a stressed predicate (cleft sentence), e.g., adi máti ("until when"), adi matīma ("until when is it that – ? "), umma Ḫammurapīma ("thus Hammurapi," introductory formula in letters), šūma ilikšu illak ("it is he who will perform the [feudal] service"). Umma, with or without the enclitic -mi, or in the Assyrian dialects mā, introduces direct speech. A strong interrogative tone can be indicated by vowel lengthening, e.g., ina bītika mannum biri anākū bariākū ("who in your household goes hungry? Should I go hungry?"). Unreal statements are indicated by the enclitic -man. Conditional sentences are introduced by šumma (or šumma-man for unreal conditions) with the verb in the indicative. In adverbial constructions the accusative is often used, e.g., imittam ("to the right"). Among the adverbial formatives are the locative-adverbial in -um/ū which with nouns functions sequentially as a case, libbu/libbum = ina libbim, libbuššu < -umšu ("in it"), and is used as an adverbial formative, e.g., balum ("without"). The locative terminative affixes -iš in the meaning "to," e.g., ašriš ("to the place") and adverbially as in elīš ("above," "upward"). All tenses of the verb are prefixed forms: iprus ("he cut") preterite, iparras ("he cuts") present-future with characteristic doubling of the middle root radical, and, unique to Akkadian, iptaras ("he has cut / will have cut") perfect, a syntactically conditioned stressed or consequential form, e.g., dayyānum dīnam idīn… warkānumma dīnšu īteni ("the judge passed judgment but afterward changed his verdict") or as a future perfect, e.g., inūma issanqūnikkum ("When they will have reached you…"). The imperative can be derived from the preterite base, e.g., pursus ( < ‡prus), imperative singular (cf. below). The precative is formed by the proclitic particle lu + preterite for the third person singular and plural and i + preterite for the first person plural, e.g., lipuš < lu + ipuš ("let him do"), lubluṭ <lu+abluṭ ("may I stay alive"), i nillik ("let us go"). Contracted forms in Assyrian differ. Other moods include the indicative in main or independent clauses having gender and plural suffixes, the subjunctive in -u (Assyrian also in -ni, also affixed to non-verbal forms) in subordinated clauses, e.g., ša īpušu ("which he did"). In Babylonia affixes of the subjunctive and ventive are mutually exclusive. Unique to Akkadian, and of a different character, is the ventive, or allative, indicating motion toward the speaker or focus of action, e.g., illik ("he came"), illikam ("he came here"). The base form participle is patterned pārisum (cf. Hebrew qal active participle), while other themes (~ Hebrew binyanim) have mu- prefix forms. There is no passive participle, but the verbal adjective of each theme is a partial semantic surrogate. The verbal adjective, used in the predicative form, is declined (the stative) with bound suffix pronominal forms, as with the predicative state of nouns (cf. above). In form, then, the stative bears great resemblance to the West Semitic perfect and the old perfective in Egyptian. In meaning the stative generally indicates the resultant state indicated by the action of the verb in its finite forms, e.g., maška labiš ("he is/was clothed in a skin"). Various pronominal morphemes are prefixed to the finite forms of the verb to indicate the person. The plural number is indicated in the second and third person by suffixes. Old Akkadian, Assyrian, and, less commonly, the poetic dialect distinguish the third person feminine singular while in Babylonian the masculine form serves both. In common with other Semitic languages, semantic nuances can be given to the verb by a system of themes or forms exhibiting characteristic structures. The basic forms are commonly four in number, though rarer types can also be demonstrated. The basic verb theme is termed G (~ Hebrew qal) and contains verbs with both stative, e.g., (w)arāqum ("to be/become pale") and fientive (transitive) meaning, e.g., ṣabātum ("to seize"). Verbs show various tense vowels between the second and third root radicals in the present-future and preterite: a – u, a – a, i – i, and u – u. The characteristic vowel of the perfect is the same as that of the present, thus iparras ("he cuts"), iptaras ("he has cut"), iprus ("he cut"). The D theme (~ Hebrew piʿel) is characterized by the doubling of the middle root radical and, in common with the Š theme, it employs a different set of pronominal prefixes than G, and shows a characteristic a – i alternation between the tense vowel of the present and preterite. The perfect here goes with the preterite in the choice of tense vowel, thus uparras, uptarris, uparris. In meaning the D can be factitive, especially with stative verbs, e.g., dummuqum ("to make good"; damāqum, "to be good"); causative, e.g., lummudu ("to teach"; lamādu, "to learn"); estimative, e.g., q/gullulu ("to treat disparagingly"; qalālu, "to be/become insufficient"); iterative, e.g, sullūm ("to pray"), quʾʾum ("to wait"). The D also serves as a denominating theme, e.g., ṣullulu ("to roof over"; ṣulūlu, "roof") and more rarely indicates plurality of object, or subject. The Š theme (Hebrew hiphʿil) is so termed after the -š(a)-morpheme placed before the first root radical. Thus, ušapras, uštapris, ušapris have the same tense vowel alternation as in D and of the nuances conveyed by this theme the main one is causative, e.g., šūṣūm ("to bring out"; waṣūm, "to go out"). An internal Š indicates entry into a state or condition of some duration, e.g., šulburum ("to grow old"), šumšūm ("to spend the night"). In the N theme, an n(a) morpheme is placed before the first root radical. Like in the G theme, various tense vowels are shown, and these can be correlated with those of the G. For parāsum, the forms are ipparras (< ‡inparras), ittapras (< ‡intapras), ipparis (< ‡inparis). The N theme is commonly a passive to the G, e.g., napšurum ("to be untied, absolved, explained"). Other nuances are reflexive, e.g., nalbušum ("to get dressed") and related middle meanings, e.g., naplusum ("to look [benignly] upon"). Stative verbs take on an ingressive meaning, e.g., nabšūm ("to come into being"; bašūm, "to be"). Within each theme occur forms with -ta and tan/tana-infixes. The t forms (Gt, Dt, Št, Nt) with the -ta- infixes give a reciprocal or separative meaning, e.g., imtalkū (["the judges] consulted together"), ittalak ("he went off "). Some t forms coincide with perfect forms making the latter difficult to recognize. The tn forms (Gtn, Dtn, Štn, Ntn) with a -tan/tana- infix give a durative or iterative force, e.g., ittanallak ("he walks around/back and forth"), imtanaqqutū ("[the stars] fall down [from heaven]"). Akkadian lacks a developed series of parallel passive themes. The G theme shows no trace of such related forms. Here the N theme serves as passive. In the D theme, some t forms, identical with other t forms of the D theme, have a passive or middle nuance, e.g., utellulum ("to become clean, cleanse oneself"; elēlum, "to be clean"; ullulum, "to cleanse"), eleppam uṭṭebbe uša libbiša uḫtalliq ("he subsequently sank the boat and thereby caused the loss of its cargo") as against mātī… uḫtalliq ("my country has been destroyed"). Likewise, in the Š theme, t forms can have a passive or middle meaning. Compare šeʾam kī masi tuštaddin (perfect; "how much grain have you brought in?") and šeʾum ša uštaddinu ("grain which was brought in"). These t forms are termed Št1 in distinction to a rarer non-passive t form, Št2, which has a unique present, e.g., lā tuštallapat ("you are not to touch"). There are several classes of "weak" verbs. Primae Aleph has two groups, those without apophony, e.g., akālum ("to eat"), and those with, e.g, epēšum ("to do"). The vowel coloring is generally a function of the underlying laryngeal, although some forms show a strong aleph. The basic phonological change here is that vʾ > v¯; thus, ‡iʾpuš preterite (pattern iprus) > īpuš ("he made"), and similarly throughout the paradigm. Mediae Aleph also have "a" and "e" classes. They further differentiate in a strong aleph group, e.g., išʾal ("he asked") and a ā/ē group which decline like vocalic roots (see below), but crossovers are not uncommon. Primae Nun is characterized by the assimilation of the N root element to a following consonant, e.g., iddin < ‡indin ("he gave"). In Primae Waw initial or intervocalic w goes to ʾ or m in post-Old Babylonian times, e.g., walādum > alādum ("to give birth"). In fientive verbs vw > uw > ū, e.g., ‡iwsib > uwsib > ūšib ("he sat"). Statives behave like Primae Yod, e.g., īqer (not ūqer < ‡iwqer; note that the occurrence of the initial or final y is very restricted in historic Akkadian and these verbs generally behave like Primae Aleph with the apophony of a >e). Both fientive and stative verbs have Primae Yod type Š forms, e.g., ušēšib ("he seated" as if < ‡usayšib), ušūšib type forms (< ušawšīb) occurring only rarely in poetic dialect (but note Neo-Assyrian ittušib, Babylonian ittašab ("he sat")). Vocalic roots ("hollow verbs" Mediae Waw/Yod) are of the pattern Cv¯C, where the middle radical has to be considered as a long vowel: ū, i, ā, or ē (secondary). In the G present-future and in the present-future and preterite of the D, the suffixing of vocalic morphemes induces reduction of the theme vowel – middle root radical and gemination of the third root radical, e.g., ikān ("he is upright"), ikunnū ("they are upright"). In Assyrian uncontracted forms are usual, thus ikūan. The last major division of weak verbs is the Tertiae Infirmae. These are final -u, e.g., iḫdu ("he was happy"); final -i, iqbi ("he spoke"); final -a, ikla ("he withheld"); and final -e, išme ("he heard"). These vowels are anceps and are long when followed by bound morphemes, e.g., iqbi, but iqbīšum ("he told him"). Two main groups of quadrilateral verbs occur of the type C1 C2 C3 C4 in the Š and N themes, e.g., nabalkutum ("to jump over"), šubalkutum ("to cause to jump over, overturn"), including a weak class, e.g, naparkū ("to be idle, unemployed"). A third type is of the pattern Š C1 C2 C2 where C2 is l or r, e.g., šuḫarrurum ("to be deathly still"). It should be noted that the normal position of the Akkadian verb in the sentence is at the end (unlike its nearest Semitic relatives) and this is most likely due to the influence of Sumerian, where the verb is similarly placed. A. Ungnad, Grammatik des Akkadischen, ed. by L. Matouš (19695); K.K. Riemschneider, Lehrbuch des Akkadischen (1969); E. Reiner, A Linguistic Analysis of Akkadian (1966), includes bibliography; W. von Soden, Grundriss der Akkadischen Grammatik (1952); E.A. Speiser (ed. ), World History of the Jewish People, 1 (1964), 112–20; G. Bergstraesser, Einfuehrung in die semitischen Sprachen (19632), 20–36; B. Meissner, Die Keilschrift, ed. by K. Oberhuber (19673). ADD. BIBLIOGRAPHY: J. Huehnergard, A Grammar of Akkadian (= Harvard Semitic Museum Studies, 45), 1997; idem, "Semitic Languages," in: J.M. Sasson (ed. ), Civilization of the Ancient Near East (1995), 2117–134.